...I'd be smart enough to solve the world's problems, I suppose. Or, at the very least, be able to understand why there's so much ugliness in the world. Not surprisingly, I picked this one because it best matches my mood today. 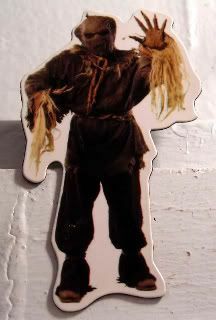 This scarecrow is from the "Of Human Nature" 2-parter Doctor Who. Dudes. They totally come alive and hurt people!!! Here, check it out at the 1:20 mark at the corner of ScareyMcScaretown and MeetYourDoom. You'll never look at another scarecrow the same again. Anyway, it's one of the official magnets from my official Doctor Who magnet sets. I know it's probably too soon for yet another Doctor Who mention, but honestly, I just bought a whole set of new custom magnets from Kristina Myers Etsy Shop, so you're gonna wanna brace yourselves for the pretty magnets that are to come. I'm just sayin'. And, no, they're not all David Tennant magnets. Well, not all, anyway. What? I get seven in the set! I do have to say, though, I really have to hand it to @kristinamyers - she never mocks the images I send her. Bless you. Ok. Fine. I will say that you might need to watch the whole of the 2-parter to actually be afraid of the scarecrows. Or...I might just be a fraidy cat. Says the girl who jumps at every little thing ... including us at the door when you we were coming. Heh. MWHID, I suppose. Still, a good episode, scary scarecrows and all.